An apple a day keeps the doctor away, but what if you can not find an apple? Simple drink tea. Mmm.. not so apt one. Anyway what I was trying to tell was that drinking tea is not that bad as it is thought to be. I can already hear cheers from all the tea lovers. Well, its true and I have some valid reasons to support it as well. But before going in those details I would like to ask you one question. How many types of tea are there apart from Green and Black? I knew these would be the words that will spring out of your head. Any guesses? Well let me take the responsibility of enlightening you on this. There are four main types of tea- Green Tea, Black Tea, White Tea and Oolong Tea. Given below are some reasons to enjoy your cup of tea. • Tea contains antioxidants which protect our bodies from the negative effects of pollution. • The level of caffeine in a cup of tea is comparatively lesser than in a cup of coffee. • Tea in itself does not have calories. So until to decide to add sweeteners or milk in your cup of tea it is a top calorie-free drink. • Tea increases the metabolism rate which in turn does not allow excess fat to mount up in the body. • It reduces cholesterol level in the body and thus trim down the chances of a heart attack. 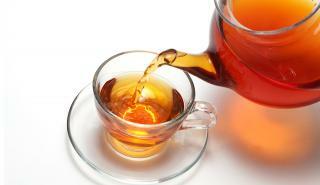 • Tea contains fluoride which helps to fight cavities and strengthen our bones. • Tea reduces the risk of hypertension. • Tea is also very effective in reducing the stress hormones. • It enhances the immune system of the body. People who drink tea are less likely to catch cold and flu. • The amino acids present in tea helps to improve the concentration power of a person. • The antioxidants present in tea help to reduce the risk of cancer. • Don’t forget you can always use tea bags to get rid of puffy eyes. After all both health and beauty are important. • Tea is also great for removing strong odors like one coming from fish. So, now when you know about all these benefits I would suggest you to avoid adding milk and sugar in you tea. No matter how tasteless it may be but to reap all the benefits of these magical leaves you need to do it. How do you prefer to have your cup of tea ? i love green tea with lemon n honey..:) i drink it every morning.. I like my chai all kadak meethi types.. But I love my coffee black and without sugar!!! I am loving my iced green tea in the summers now!!!! Nice tips. I really appreciate to those tea drinkers because they take good care of their self. With proper diet, exercise and take an ample rest will be enough to maintain healthy living.